In the midst of this downcast coverage, I thought it important to discuss the virtues of the venerable Sony brand — and the best way to do that is to extol the man behind the brand, Akio Morita. In 1946 Akio Morita along with Masaru Ibuka started the company with a scant $500 and a floor of a fire-bombed Toykyo department store for an office. From the very beginning, Morita-san advanced some strong beliefs and philosophies which shaped the company which has become the multi-billion enterprise and one of the world’s most valuable brands today. 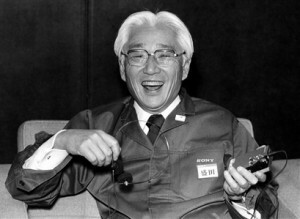 “We do what others don’t.” Morita-san felt strongly that Sony “never follows.” His commitment to true innovation led to a string of firsts for the company including the first pocket-sized transistor radio, the first color television tube, the first home video tape recording unit, among many others. Beyond products, Morita-san infused everything Sony did with this convention-breaking spirit. Creating a culture. The prospectus drafted by the founders of the company speaks of their desire to create an organization in which “persons could become united with a firm spirit of teamwork and exercise to their hearts’ desire their technological capability.” Morita-san’s mission was to create more than products; he wanted to create a new kind of company, a distinct way of doing business, a culture. These are just a few examples of the spirit of Morita-san which became the spirit of the company — and the Sony brand. Say what you will about Sony’s current state and future outlook. The man behind Walkman — and the way he built the Sony brand — is an inspiration to any entrepreneur or business leader today.